Hardwood Flooring Edgewood | Hardwood Floor Installation Kent | Wood Floor Seattle - Seattle Flooring Co.
Hardwood has been used as a flooring material for centuries. It is unrivaled in quality and beauty, adding value and comfort to your home or commercial space. Choosing to install hardwood flooring is a big decision, and this page will help you to determine if it’s truly the right flooring material to suit you needs and budget. Solid Wood Flooring – Available both finished and unfinished, this is what most people envision when they think about hardwood flooring. Solid wood flooring is further divided into three subcategories: strip flooring, plank flooring, and parquet flooring. Engineered Wood Flooring – Contrary to popular belief, engineered wood flooring isn’t fake. 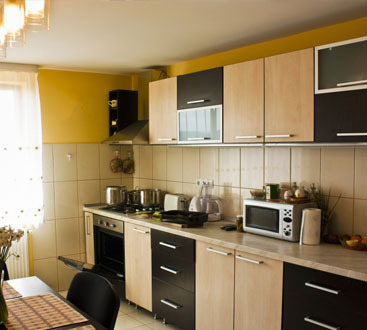 Don’t get it confused with laminate wood flooring which, while it may look like wood, contains no organic material. 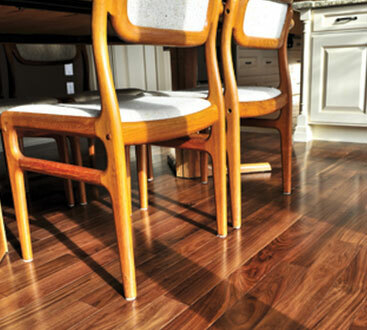 Engineered hardwood flooring is made by attaching plastic laminate veneer to real wood. Acrylic-Impregnated Wood Flooring – This type of hardwood flooring has sealant mixed throughout the wood, instead of just on top. It’s very hard and stands up well to moisture and scratches, which is why it’s so popular in commercial settings. Hardwood flooring can last for decades, sometimes longer with regular maintenance. Hardwood flooring is very easy to clean. Forget the vacuum, just grab the broom or dust mop! Hardwood flooring resists bacteria and parasites that love to linger on carpeting. 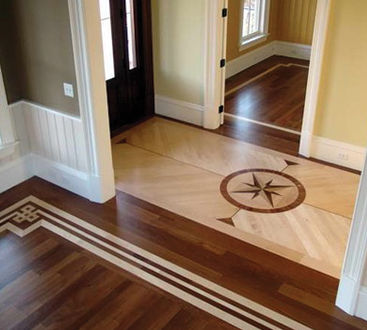 When hardwood flooring is scratched, gouged, or stained, it can often be refinished to look good as new. You can’t say the same for laminate, vinyl, carpet, or tile flooring. Hardwood flooring provides a warmth and added value that’s unparalleled. More hardwood is grown in the USA every year than is cut down. Hardwood flooring contributes to better indoor air quality. It takes less water and energy to create hardwood flooring that carpeting, vinyl, tile, or laminate flooring. The wood flooring industry is constantly planting new trees so that protected forests and woodlands aren’t threatened by the need for hardwood flooring. Interested in getting hardwood flooring installed at your home or business? Contact Seattle Flooring Company or request a visit from our Mobile Showroom today!